So far acowan has created 39 blog entries. J Gen Physiol. 2019 151(2): 258-263. Surve, S. V., Myers, P. J., Clayton, S. A., Watkins, S. C., Lazzara, M. J., and Sorkin, A.J Gen Physiol. 2019; 30(4): 506-523. 17-11-2018. Announcing the release of VCell 7.1. VCell 7.1 adds the ability to explore existing models in the database and VCell functionality without registration. It has an improved model database info panel with model provenance, annotations, direct links to Pubmed and journal websites for models described in publications. These add to the new features for 2D kinematics to solve simulations with moving boundaries and the ability to use the COMSOL Multiphysics solver already in VCell 7.0. 2018-07-10. A new Vcell spatial model of calcium influx, buffering and diffusion in mossy fiber boutons was published by Chamberland and co-authors in PNAS. Visit our published models page for links to the paper. Action potential counting at giant mossy fiber terminals gates information transfer in the hippocampus. Proc Natl Acad Sci U S A. 2018 Jul 10 115: 7434-7439. 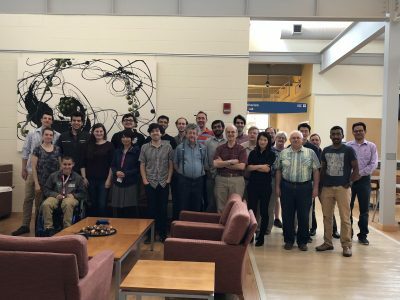 2018-6-18 VCell hosted its 19th annual VCell Short Course on June 12-14, 2018. Ten scientists traveled to work with the VCell team to construct Virtual Cell models based on their own research interests. It was exciting to see the breadth of cell biological problems to which VCell models were applied. Thanks to all for a successful time! Cytoskeleton (Hoboken). 2018 Apr 75: 164-173.